The Mayo Clinic defines Cyclic Vomiting Syndrome as being, "characterized by episodes of severe vomiting that have no apparent cause. Episodes can last for hours or days and alternate with relatively symptom-free periods of time." It then goes on to say that episodes generally start at the same time of day, with the same level of intensity. For the full article visit here. The longest episode I ever had lasted 14 days. Since then I always go to the hospital within 24 hours of the start of an episode. I find use of medical help necessary for my condition as well as most other sufferers. I've waited to see if the symptoms would cease on their own. When I've finally made it to the Emergency Room anyway (not too many ways around this but prayer that the dissolvable zofran works), my potassium levels have been found to be dangerously low. Plus I've been so dehydrated that I've become completely helpless. The last time I went into the Emergency Room, I was waiting for the nurse to see me next to place the IV., I just sat there and gently slapped with the back of my hand the locked drawer that contained the IV tools. Sitting in a chair dizzy from dehydration, all I could do is smack the IV fluid drawer like it was an old TV with bad reception or a coffee pot that wont percolate fast enough. All I could think about was getting fluids in me. I became a saline addict that day. I spent decades with this disease, not really understanding I had a condition and wasn't just more susceptible to the stomach flu or food poisoning. There is no cure for this disease and no definitive cause. Although it is being studied. Often children who suffer from migraines will come down with this disease. About three out of every 100,000 children will come down with cyclic vomiting syndrome or what some refer to as abdominal migraines. Females are slightly more prone to get this disease and while all races have been afflicted, it does seem to affect caucasians the most. Some studies say that chronic marijuana use can cause the symptoms associated with cyclic vomiting syndrome. While the symptoms are very similar, chronic marijuana use can cause a condition known as cannabinoid hyperemesis. A suffer such as myself, who has spent years being a frequent visitor to the Emergency Room, can tell you that this comparison is something I'm fairly sensitive about. This disease is just now getting recognized by the public and by the medical community. Before, when I went into the emergency room I would at first be labeled as what medical professionals refer to as a drug seeker. A drug seeker is someone who goes to the emergency room with the intention of tricking doctors into prescribing pain medications and who doesn't necessarily suffer from a medical condition. Because I was always initially screened as a drug seeker, it's fairly important to me that I don't use or be associated with marijuana or any other street drugs. To see my post about the difference between cvs and cannabinoid hyperemesis visit here. Dysfunctional mitochondria has been suggested as a cause of the disease. The mitochondria are located in every cell of the body but the red blood cells. Because the mitochondria play a large role in energy production in the body, I refer to them as the car battery and our bodies the car. To see my post regarding this, visit here. Mitochondrial disease is its own illness. Symptoms of this disease include poor growth, loss of muscle coordination, muscle weakness, visual problems, hearing problems, learning disabilities, heart disease, liver disease, kidney disease, gastrointestinal disorders, respiratory disorders, neurological problems, autonomic dysfunction and dementia. Currently there is no cure for mitochondrial disease although there is a test for it. 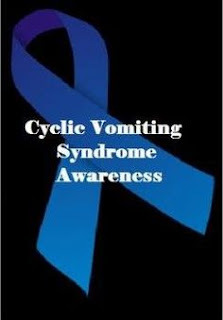 There is no test for cyclical vomiting syndrome. Though there are no current medications for cyclic vomiting syndrome, enzymes like Co-Q10 and L-Carnitine that both aide in the ATP energy production in the cells has been used with success. Other migraine medications such as Sumatriptan have shown to ease the severity of the symptoms. There has even been a recent development of nasal Sumatriptan to aide patients experiencing an episode. Often when I would visit an emergency room, most medical professionals had never experienced a symptomatic cyclical vomiting syndrome patient. Most people probably wouldn't necessarily understand why a patient experiencing a CVS episode would need IV. medications such as Zofran or Reglan, or even intravenous fluids. When a person is having a cyclical vomiting episode they simply cannot stop vomiting. They vomit to the point of severe dehydration from fluid loss. In order to recoup fluids the vomiting must stop and/or fluids must be given to the patient. Occasionally if I managed to get to the hospital before I reached the point of dehydration, I would be given an injection to stop the vomiting. Usually though, I would go to the emergency room already dehydrated, need IV. fluids, and given a cocktail of drugs to try and stop the vomiting. It usually took hours, but so far the vomiting episodes have always ceased. When I am having an episode I vomit approximately six times per hour. I would come down with an episode about 3-4 times per year. Now that I'm on enzyme therapy (CO-Q10, L-Carnitine, Creatine) and exercise treatment, I've only had one episode in the last three years. When I'm not symptomatic, other than recovering being bedridden for days, my life is fairly normal. That's why this disease is referred to as an invisible illness. It's so invisible I didn't even see any huge difference between myself and other healthy individuals. Perhaps I also suffered from optimism bias in that I wanted to be a healthy happy individual so much, I simply refused to see that my body wasn't like everyone else's. However, I see it now. I'm doing something about it. I've never felt more healthy or been happier. There is so much more about this disease and new information is always emerging. If there's anything I missed or you think I should add please comment below and/or message me.